When I arrived for my first day at Cassels, I whipped out the office map to scope out where my office was. It was indeed a corner office, but it was in an INTERNAL corner. I’m talking the other side of the hallway from where the windows are. As in, they couldn’t have possibly put me any further away from them UV rays. Luckily, I was not alone. I had Jackie as my office mate. It was cozy (especially with two of us), but we never had a dull moment. Having an office mate was great, almost as nice as having a window in your office! But who needs a window when you have an officemate, am I right? She brought enough sunshine into the room for all of us. We got used to our summer student home. We were comfortable; easy access to the elevators if we ever wanted to sneak out early, low foot traffic so we only ever got distracted if someone wanted to distract us, plus we never knew when it was raining so we could hardly ever be upset about the weather! But let me tell you, when I got that email saying “Moving”, the glimmer of hope returned. I remembered that there was a sun after all! And maybe even a big enough desk space to spread all my work out and make myself look EXTRA busy! With only three weeks left of our summer, I learned that I would be moving into what seemed like the executive suite, I HAD FINALLY MADE IT! (well not quite). As our summer started to wind down and the firm was getting ready for the much anticipated return of the articling students, many of the summer students got moved into what we like to call “associate” offices so that the articling students could have our cozy little internal caves offices. I’m not sure if you can get a tan through a window, but if you can then my tan is definitely coming along nicely as I sit here staring at my computer instead of out the window. But trust me, just knowing it’s there makes a world of difference. And that my friends, is the story of my office upgrade! 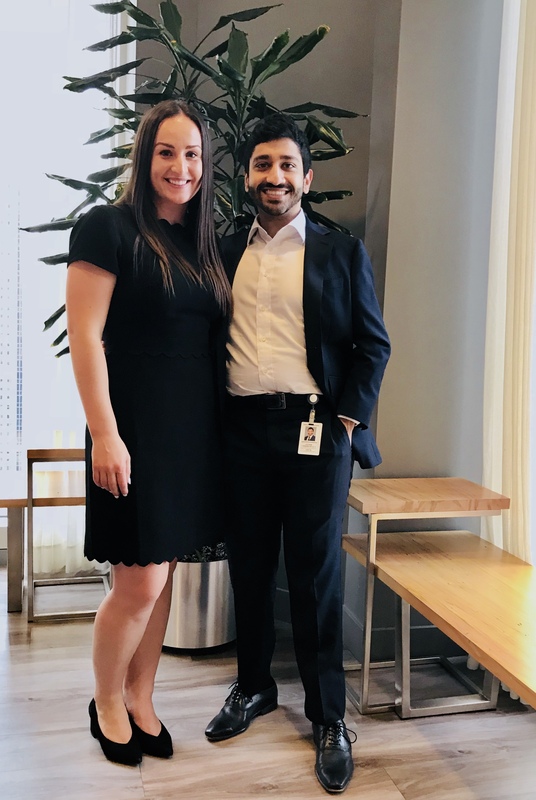 Last Friday, a group of CBB summer students and lawyers took an early morning detour on the way to work, to a SoulCycle spin class. It was INTENSE. We cycled like maniacs, we bonded, we sweat (were those tears? ), and no one barfed thank goodness. Then we suited up, grabbed a smoothie and made it to the office. It was a super satisfying way to start the day. That got us talking about how to balance our busy work lives with getting some exercise. We all hear that regular exercise is important for both our physical health and our mental well-being. But we also know lawyers can work very long hours, and typically sit at a desk in front of a computer screen for long stretches of time (like what I did there?). So we asked some of our summer students how they make time for physical activity in their busy lives, and what they do to keep fitness fun! Marie says exercise is important to her because it helps her focus better. She is especially committed to maintaining an exercise routine in the summer, because the weather is so nice. Marie likes to mix things up between running, boxing, kayaking, and trips to the gym. 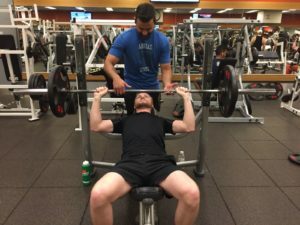 Kieran says when exercise is fun it’s a lot easier to consistently make it happen. 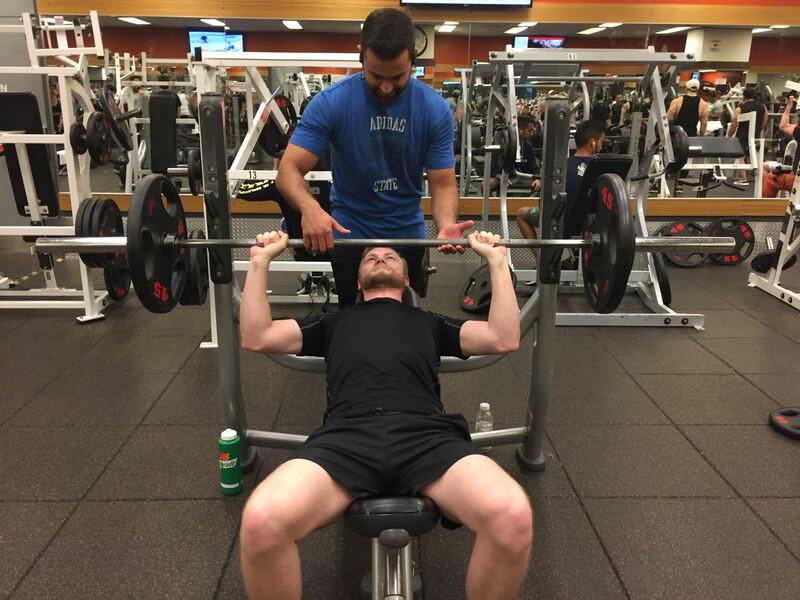 That’s why he goes to the gym with friends, and plays team sports like softball with the CBB Miner Leaguers. because everything is more fun with friends! Spencer in our Vancouver office fits in a boot camp style workout with co-workers twice a week on her lunch break. She says it’s a great way to re-energize her day. Rob likes to walk around the office floor and visit the neighbours to get away from his desk. He gets arm day in by carrying banker boxes of files to his lawyers’ offices. Sometimes he even skips the elevator and takes the stairs! Corina says doing yoga on the weekends helps restore her body and mind. Even practicing for 10-15 minutes in the evenings makes a huge difference in how she feels. Jackie says working out as much as she can is an important stress reliever, both as a student and when she’s working. Sitting at a desk all day can leave her feeling lethargic, so Jackie makes an effort to get to the gym at least three times a week. if she’s working late she will make it up on the weekends when there are no excuses. Jackie likes to lift weights and do cardio. Anything to get her blood flowing and her body moving! Carmen, Aaron, Nico, and Kieran are all on the Cassels Brock Miner Leaguers softball team this summer. It’s been an amazing way to meet people and have some fun outside the office. The team did great in the regular season and are now headed for the playoffs, so stay tuned! These guys are all inspiring for managing to get up early, stay up late, work, workout, and (hopefully) have some downtime too! But it’s not always possible to do it all. So let’s all thank the real MVP of summer at CBB…COFFEE! As a summer student at Cassels Brock you get three strikes and then you’re fired. Just kidding, this is a post about softball. Get ready folks because I am about to tell you why being part of the CBB softball team is the only important thing you will do during your summer with Cassels Brock. 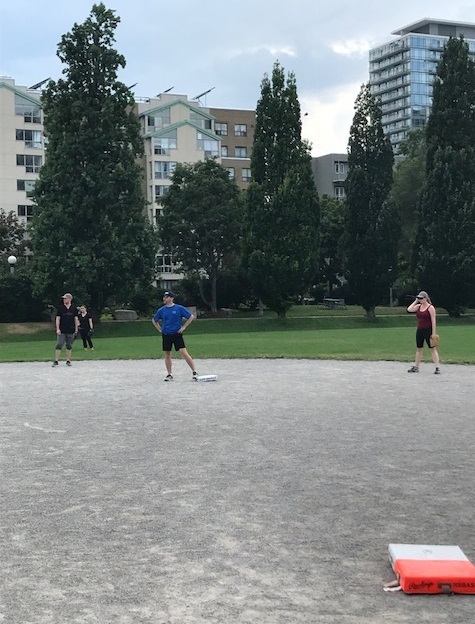 Our league is made up of Toronto’s big Bay St. firms and it’s a casual, co-ed, self pitch style of softball and honestly not that athletically demanding, fun for all! Fun, but also competitive, as our team has taken home the play-off title the past two years and look to make it a three-peat heading into this years’ playoffs in what should be a top four position. Captain Alex Slota in action. Note the power stance. 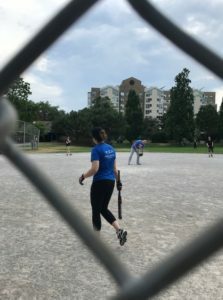 Future associate litigator extraordinaire and team MVP Meghan Rourke stepping up to the plate. You would think that after all this hanging out, eating and drinking, meeting new friends, and casually swinging a bat around, you would get to go home and that would be the end of it, but you would be WRONG. The next day you get the Alex Slota special; the email highlight reel. It’s an email to the team with game highlights, and of course, biggest blunders and so much more. *** It would be fair to say it’s the highlight email of the week firm-wide. So, to come full circle on this post, don’t disappoint Captain Alex. *Only if you’re good though. **Business Development billings are very important for your personal and career growth. Softball is an indispensable opportunity to interact with partners, staff, and firm alumni in a fun and relaxed environment. 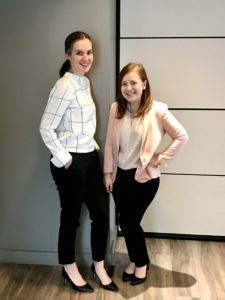 ***None of the 2018 summer students have been featured in biggest blunders (yet). It should also be noted that despite being present at a majority of the games, Kieran is the only summer student who still has yet to be featured in the emails at all. Aaron “Speedy Gonzales” Cressman was especially fun to watch run the bases, too. The cloud (and I mean cloud) of dust that he leaves behind him when he runs, is beyond impressive. You basically have to call a time out to let the dust settle every time he reaches base. We’re bringing back Fashion Files for Summer ’18 with a whole new cast! We love the summery touch Thea’s floral accent blouse adds to her classic black suit and pumps. Keep a few staples in your closet, and work with them (black pants, white collared shirts). Can’t go wrong with a pearl necklace. Anne Hathaway in The Devil Wears Prada. Ed: Wait…she works here now?! A great bag is key for a law student on the go. I keep spare shoes at the office to match any outfit. Adding a stripe, or a polka dot to any of your staple suit pieces can easily upgrade your look. N: I wear a lot of black. 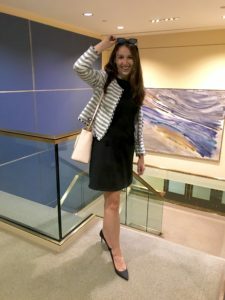 it’s easy to match any blouse to a black skirt or pants, then I grab a black blazer and I’m done! E: 1. Dry shampoo, dry shampoo, dry shampoo! and 2. have a blazer in every colour. N: Aritzia and The Bay. I always order online, it saves so much time! E: J. Crew and Club Monaco. N: A simple gold necklace or bracelet, and a watch. E: Glasses, and funky statement necklaces. Carmen’s shift dress with the sweet trim detail is perfect for leaving the suit jacket behind and heading out after work. Be like Aamir: Lose the tie and loosen up after a long day. A: Keep your ties tied and ready to slip on. A: Made2Measure for suits, Aldo for shoes, and Le Chateau for belts. C: The key to any accessory is to wear it with confidence. A: Our very own Mr. Aaron Cressman, (but only when he wears that one suit I also have). At some firms there is the horrible very helpful randomizer, while at others it is on a first come first serve basis. Here at Cassels we have a different way of administering tasks…. ROCK. PAPER. SCISSORS. Honestly just saying the name gives me shivers as I currently have the worst record for these battles. While the wounds are still fresh, I am here to explain how this process works, and why it actually does work. Don’t worry young grasshoppers, I will first give you some background so you can laugh along with the jokes like you have some idea of what’s going on. To understand the point, dare I say significance of rock paper scissors you need to understand how the students get work at Cassels. 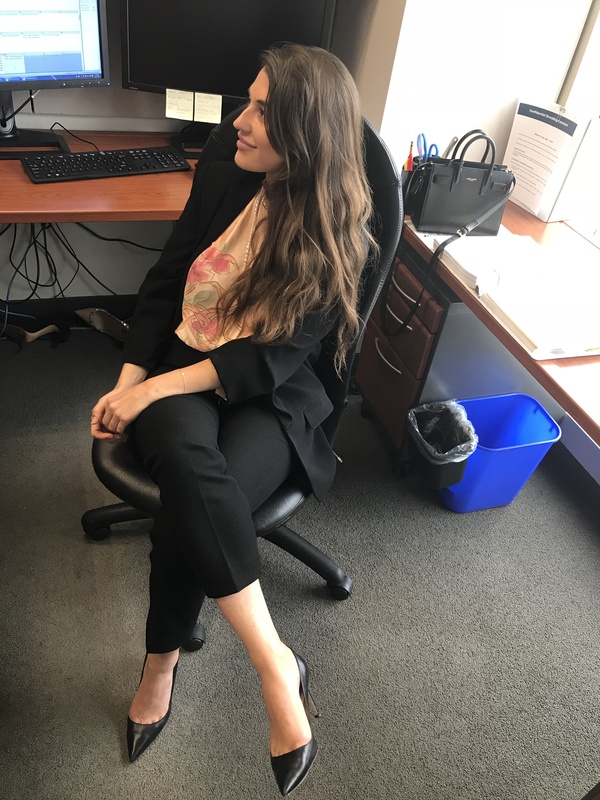 Much of the work you receive as a summer student comes through a list-serve which any lawyer can use as a means to reach us with an assignment they have. There are two types of students (1) List-serve students; and (2) Students who are apparently too busy for the list-serve. But, that’s a story for a different day. As I was saying. When a list-serve email comes in, that is where the bloodbath begins! But alas, that is not always the case and there are many times when 2-3 students want the same assignment. When this inevitably happens, we need to find a fair way to decide who gets to do the work. Now, I could make up a story about how it came to be but as a certified investigative journalist – I am going right to the source – scrolling through 3 months of Whatsapp messages to find the initial messages that started this system. Reza: Hahaha, kk on my way! After this event the student of Cassels realized Kieran, now officially known as Sheriff Kieran, was onto something. It has become standard practice in our group chat that if there are 2 or even 3 (yes, we’re skilled enough to do a three-way RPS battle) students who want an assignment, Rock Paper Scissors is in order. However, there are times where we crave the in-person drama and will make the trek to the other student’s office for a LIVE EVENT. Because RPS has become such a source of entertainment for the students, if there is an “in-person” battle, the students involved will send pictures of the event – usually of the loser crying in the corner. I’m going to be totally frank with you – RPS has ended friendships, started rivalries and resulted in a lot of tears. It’s not a game for the weak. I’ve learned that the hard way. For every rock I play, there’s a paper to smother me, for every scissors I play, there’s a rock to crush me, and for every paper I play there’s a pair of scissors to cut me up. Luckily at Cassels, they hire students who are positive and resilient. So, while I may lose almost everyday in RPS, I know that one day, maybe not this summer, I will be a winner.